Earthtales: Storytelling in Times of Change by Alida Gershie. London: Greenprint, 1992. An extensive collection of well-chosen tales. Useful as a storytelling source. I had to order it through inter-library loan. Family of Earth and Sky: Indigenous Tales of Nature from Around the World by John Elder and Hertha D. Wong. Boston: Beacon Press, 1994. A widely-ranging collection, not necessarily tellable, but thought-provoking. Hidden Stories in Plants: Unusual and Easy-to-tell Stories from Around the World Together with Creative Things to Do While Telling Them by Anne Pellowski. New York: MacMillan, 1990. The Language of the Birds by David M. Guss. San Francisco: North Point Press, 1985. Guss includes poetry, essays, and folklore in this thoughtful collection. You might not find tellable material here, but will gain from experiencing the book. Myths of the Sacred Tree by Moyra Cladecoot. Rochester, New Vt.: Destiny Books, 1993. Cladecoot is interested in the mythological meanings of tree, her stories go deep, and will interest those who tell primarily to adult listeners. The Rain Forest Storybook: Traditional Stories from the Peoples of South America, Africa, and South-East Asia by Rosalind Kervin. Cambridge University Press, 1994. Great collection of exciting tales. I ordered my own copy through Amazon.com. It's available in paperback. A good addition to any elementary teacher's personal library. Spinning Tales, Weaving Hope: Stories of Peace, Justice and the Environment by Ed Brody, Jay Goldspinner, Katie Green, Rona Leventhal, and John Porcino of Stories for World Change Network. Philadelphia, Pa.: New Society Publishers, 1992. Favorite tales for telling contributed by professional storytellers. 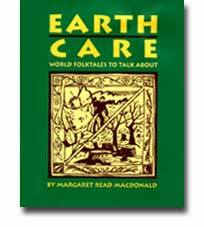 My own collection, Earth Care: World Folktales to Talk About (Linnet Books, 1999) is designed as a companion to my Peace Tales: World Folktales to Talk About. All the tales in Earth Care are chosen because they make some point about man's relationship to the earth. When I flew over Borneo and saw the forest in flames, I knew my next book must be a sequel to Peace Tales. It won’t do us much good to learn how to live in peace, if we don’t have any air to breathe or water to drink. It was easy to find these tales. Most tribal groups tell cautionary stories designed to teach the importance of caring for their environment. The book contains 41 stories and 41 proverbs. 53 cultures are represented. The book is an excellent source for telling or reading aloud. Many of the tales include audience-participation, several are short enough to read in a minute or less. All should provoke thought Click for more information on this book.